get a dog. a good, loyal dog. 'have-dog-will-travel' is a new media company formed in 1998 on the basis that design is a useful and necessary element -- not a bonus -- on the web. Disillusioned with the corporate "creativity is overrated when compared the almighty dollar" mentality and tired of grinding out "been there, done that" sites, the idea for 'have-dog' was born: an attempt to bring easy navigation and clean, customized design to the web. As for the name? It started as a joke, and it stuck. It's too long, it's weird, it has nothing to do with the business at hand, and the hyphen in the url makes the url difficult ("H-A-V-E, hyphen... no, a hyphen, you know, like a dash or a minus sign? Yes! So, 'have dash dog dot com'..."), but it's ours, and an ongoing loving homage to my childhood dog, a husky-cross named Mercedes. 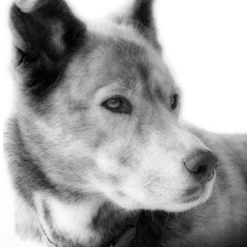 In November 2005, the dog behind 'have-dog' passed away after 15 loyal years. Cede, I miss you girl!